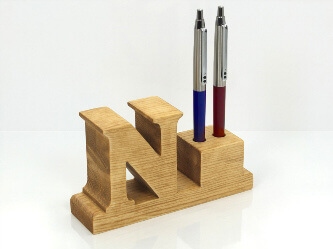 These one of a kind handmade personalized pen holders are a great noticeable décor for every office and home. 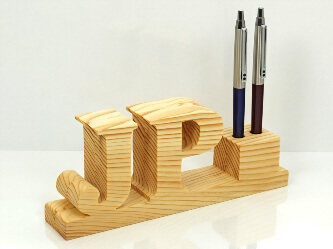 These unique pen holders are perfect gifts for storing pens and pencils with their own personal characteristic. They are made from one piece of natural pine wood. The wood is sanded smooth and all edges are rounded over. The personalized pen holders are finished with olive oil or a beautiful non-toxic satin finish, which makes pen holders and name puzzles the perfect gift for kids, pupils, students, family members and relatives or office gifts for colleagues and friends. 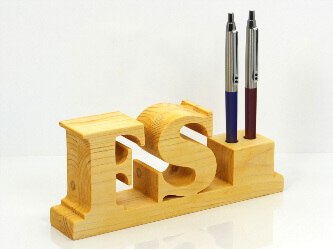 The elegant pine wood pen holders with personalized letter(s)/ initial(s) will dress any desktop or tabletop into a different stage. 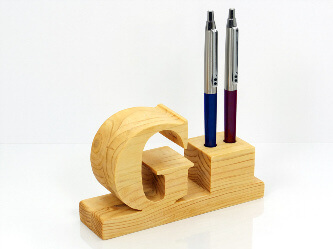 The custom designed pen holders including initial(s) chosen by you will bright your hard work days and will draw everyone’s eyes, asking where it is from. This is a gift that will be treasured forever! NOTE: We do not have ready to buy pen holders. We make them only by order. Dimensions: 14 x 8 x 4 cm. Dimensions: 19 x 8 x 4 cm.